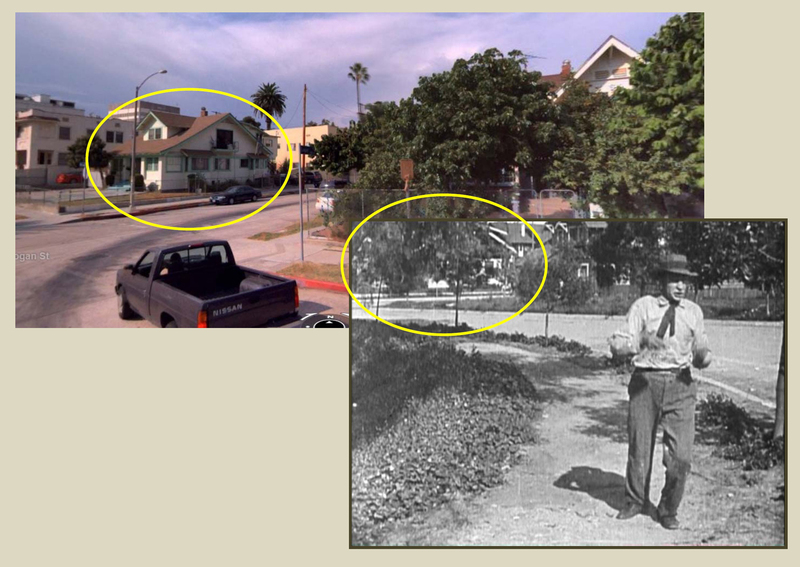 Cruel, Cruel Love – Charlie’s handyman races up the steps to 1629 Park Avenue (center), also appearing behind Chaplin (oval) as he stands at the NE corner of Echo Park. 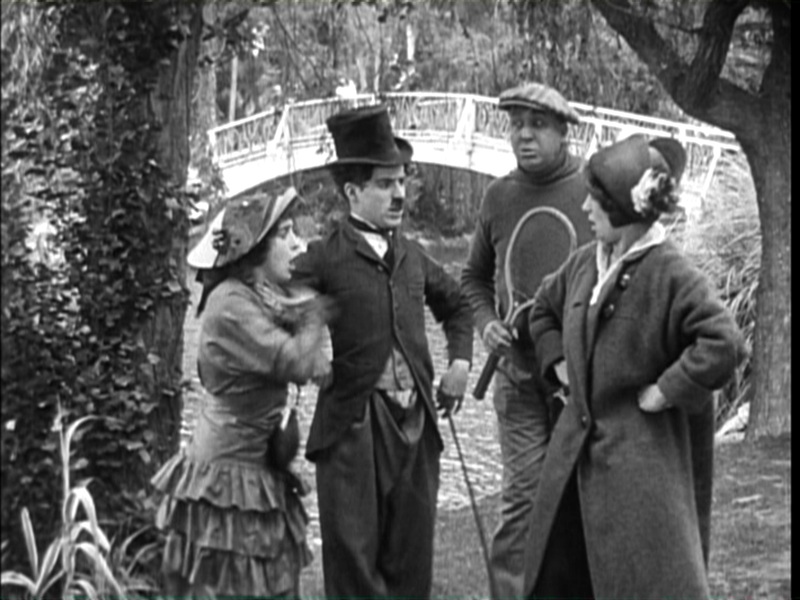 Mabel Normand, Chaplin, Mack Swain, and Eva Nelson in Mabel’s Married Life (1914) beside the Echo Park bridge. 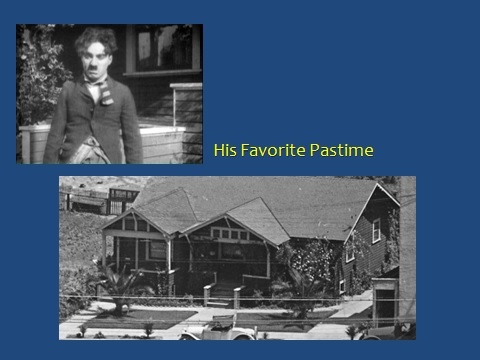 As I explain in my book Silent Traces, Charlie Chaplin filmed several early comedies in Echo Park, just a few blocks south of the Keystone Studio where he began his film career 100 years ago. Perhaps unsurprisingly, it turns out that Chaplin and other Keystone stars also filmed beside homes that are still standing directly across the street from the park. As shown above and elsewhere below, Chaplin’s home in Cruel, Cruel Love (1914) is located at 1629 Park Avenue, at the NE corner of Logan Street. Other remaining homes along Park Avenue appear in Keystone films too (see below), standing just a few blocks east from where Chaplin filmed on Sunset Boulevard 100 years ago, as reported HERE. (Once again, these discoveries are possible due to the wonderful image quality of the Chaplin at Keystone DVD collection from Flicker Alley). Looking west along Park Ave. from Logan St. – scenes from A Film Johnnie (left) and A Flirt’s Mistake (right). I began paying attention to the front porches appearing in early Keystone films after noticing that a dozen other movies were shot beside the front porch where Chaplin filmed the initial scene of his career (as reported HERE). The porch in the Chaplin/Mabel Normand comedy Mabel at the Wheel (1914) reveals a “1629” address and an array of distinctive potted plants that clearly matches Chaplin’s porch in Cruel, Cruel Love (see below). Click to enlarge. Four views of the 1629 Park Ave. porch, now closed over; clockwise from upper left, Roscoe Arbuckle in A Flirt’s Mistake, Mabel Normand in Mabel at the Wheel, today, and Cruel, Cruel Love. 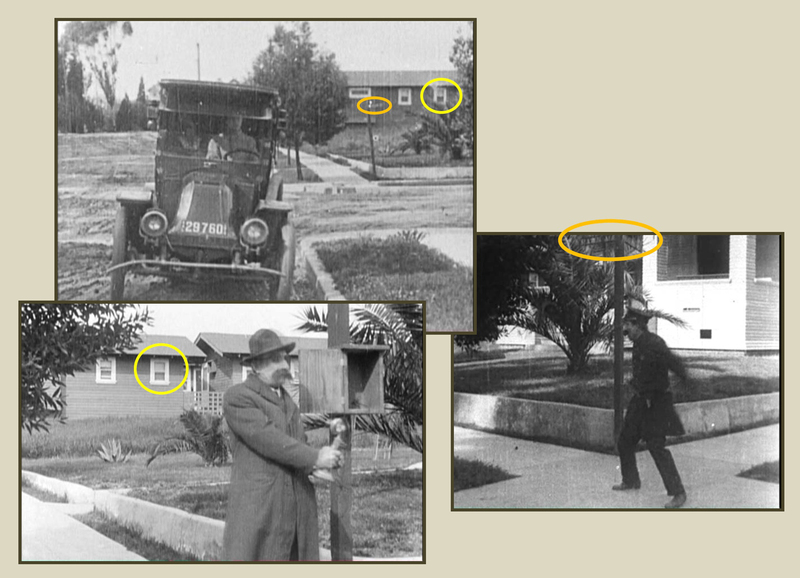 I also noticed a group of small bungalows that appears both in Cruel, Cruel Love and in Chaplin’s A Film Johnnie (1914), that reveal a street corner consistent in appearance to a corner appearing in the Roscoe Arbuckle comedy A Flirt’s Mistake (1914). 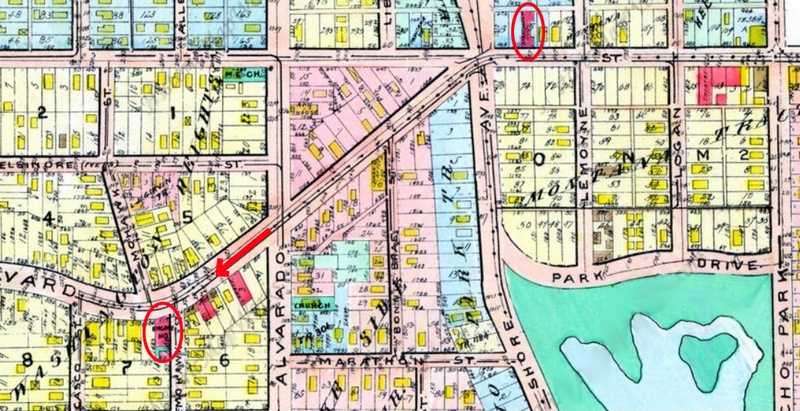 The Arbuckle corner reveals a street sign reading “Park Ave” (see below). 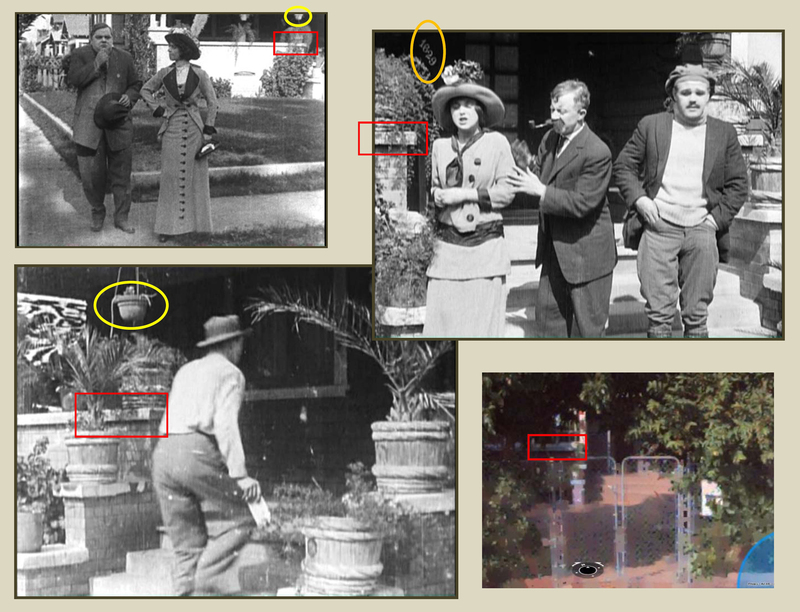 Although hard to spot at first, I finally noticed that Chaplin’s “potted plant” porch also appears in A Flirt’s Mistake (see above), tying the pieces together. 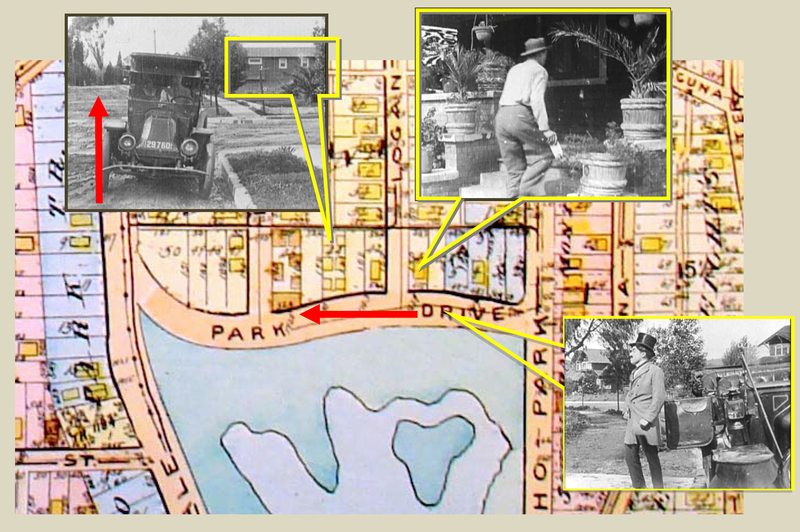 So on a hunch, I researched “Park Ave” in connection with the 1629 “potted plant” address, and found that Chaplin’s Cruel, Cruel Love home is still standing due north of Echo Park at 1629 Park Avenue. Cruel, Cruel Love – Chaplin’s handyman runs along the north edge of Echo Park. The home on the NW corner of Park and Logan (oval) is still standing. 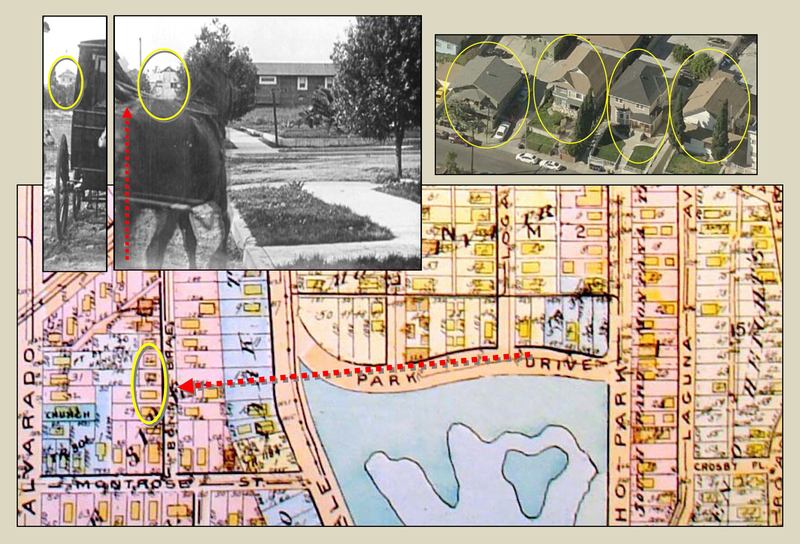 Remarkably, a second home appearing both in Cruel, Cruel Love and in A Flirt’s Mistake, at the NW corner of Park and Logan, is also still standing (see above), as is the group of bungalows, just up the street, at what was originally 1711 – 1715 Park Ave (see below). Cruel, Cruel Love (top), A Film Johnnie (bottom). 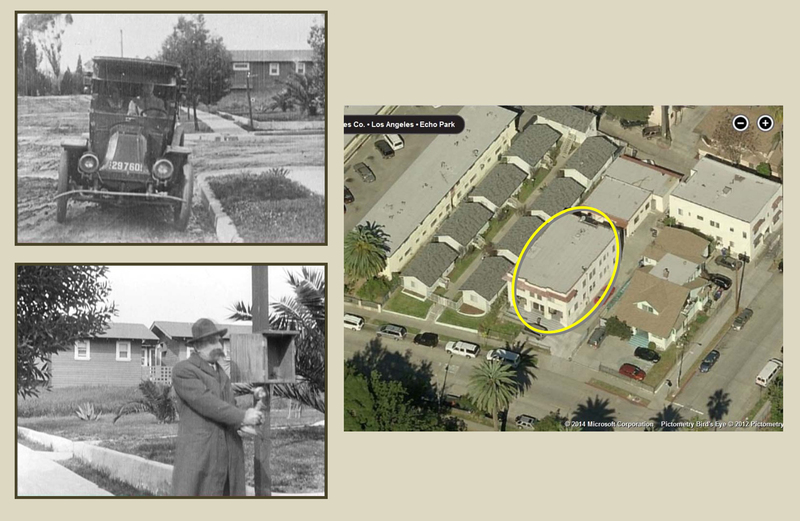 Between the bungalows and the corner home, on what was a vacant lot during the 1914 filming, is an apartment block (oval) built in the 1920s. Two views from A Flirt’s Mistake keyed to north up Logan Street. 1629 Park Ave. stands to the right. Below is a broad overview of the filming sites related to the north end of Echo Park. The arrow points west along Park Avenue past the corner of Logan. Click to enlarge. Three views from Cruel, Cruel Love; looking west past Logan from Park, looking at the porch of 1629 Park Ave., and a view from the corner of Echo Park towards 1629 Park Ave.
Click to enlarge. Perhaps most remarkably, when an ambulance arrives at Charlie’s home during Cruel, Cruel Love, the camera looks due west along Park Avenue, past Echo Park to the left (south), towards vintage homes on a hill in the far background (yellow ovals) that are still standing on N. Bonnie Brae Street. I can’t identify the homes positively, but they are likely among the four pictured here at the upper right. Chaplin at Keystone from Flicker Alley: Copyright (C) 2010 by Lobster Films for the Chaplin Keystone Project. Today photos Copyright (C) 2014 Google Inc.; Bing Maps Bird’s Eye – (C) 2014 NAVTEQ, Pictometry Bird’s Eye (C) 2014 Pictometry International Corp., (C) 2014 Microsoft Corporation. 1629 Park Avenue on Google Street View. This entry was posted in Chaplin Tour, Charlie Chaplin, Keystone Studio and tagged A Film Johnnie, A Flirt's Mistake, Chaplin Locations, Charlie Chaplin, Cruel Cruel Love, Echo Park, Keystone Studio, Mabel Normand, Roscoe Arbuckle, Silent Comedians, Silent Comedies, Silent Movie Locations, Silent Movies, then and now. Bookmark the permalink. Thanks for all the illuminating research. Regards Thom. Another Herculean effort! Thanks John- I was at Echo Park in 2008, I’ll have to review my video and photos to see if I captured your discoveries! As always, John, I really appreciate all the work you do. It blows my mind! Just the other day, I was looking at your research on how Musso and Frank could be seen in “Cops.” So thankful that you do this stuff! This is great work. I have a house in Echo Park that I’d like to speak to you about. Thanks. Fantastic! Thank you for doing this research so neat! Awesome, I used to live in the green house on the opposite corner! I had no idea! I have a house in Echo Park that was owned by Frank Short. Does anyone know of this silent film actor? Thanks so much for this awesome website! But I’m confused. Where’s his house in echo park? The house still standing at 1629 Park Avenue plays his house during the film – he didn’t live in Echo Park. Thanks for all your research! Great article! For me this film https://putlocker4k.me/16-shadowman-2017.html remind the persona of Chaplin. I want to compare.